*some assembly required: Shoalwood project complete! 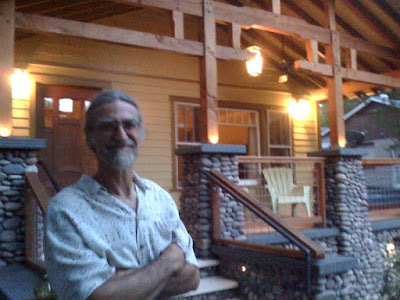 Here's master builder Lee Mackenzie, standing in front of the amazing porch he built for our clients at 5511 Shoalwood Avenue. We attended a housewarming party there last week, and the house looks fantastic. We'll have final photos of the project soon, but for now you have to just deal with the grainy iPhone shot!